If someone has just been in an accident and you suspect head, neck, or spine injury, it is essential to always call 911 immediately. 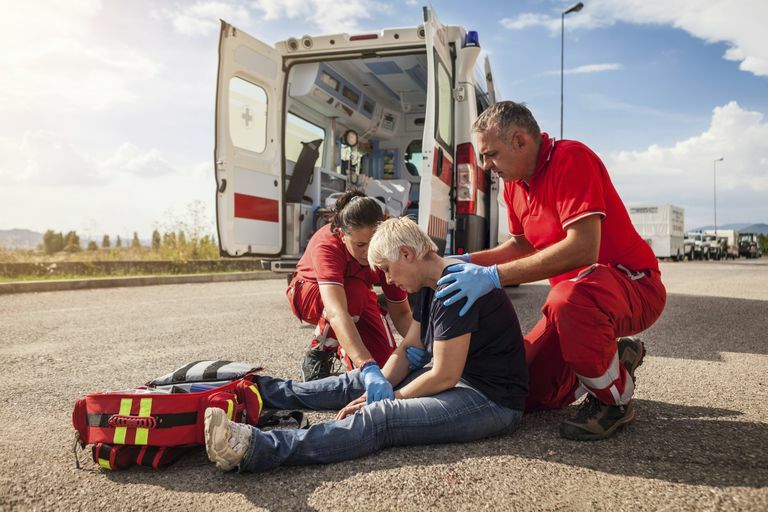 As long as the injury victim is not in immediate danger of further injury, do not move the person because you can make their injuries much worse. The signs and symptoms of a head injury depend on the severity of the trauma, and which structures of the face and head are affected. Some signs you can see, and other signs you can’t see. When emergency personnel arrive, they will assess the situation and many times immobilize the accident victim. What Do Medical Providers Look For? Once the patient is stabilized, the entire head is checked for cuts, torn tissue, bleeding, and other soft tissue damage. Are the eyes protruding outward or have they sunk backward into the skull? Is there anything interfering with breathing through the nose and mouth? Are there broken bones to the face and skull? The signs and symptoms of traumatic brain injury that have resulted from head trauma may be present right away or may take time to develop. These signs also depend on which part of the brain was damaged, and if there is bleeding under the skull and inside the brain. Loss of consciousness and/or disorientation are common after head trauma. After a mild traumatic brain injury, there may be no loss of consciousness or it may only last a few minutes. Mild confusion or disorientation may also be experienced. Loss of consciousness that lasts between one and 24 hours is often classified as a moderate brain injury. There may be amnesia, with no memory of what happened right before or after the head trauma occurred. Any time someone is unconscious for over 24 hours after head trauma, it is considered a severe head injury. Amnesia often lasts longer for these individuals, and they may never remember the events surrounding the traumatic event. Focal brain damage happens to a limited and focused area of the brain. It’s easier to predict what types of signs and symptoms will develop because modern medicine knows what each area of the brain controls. For example, damage to an area that controls vision may cause predictable changes in how someone sees. Damage to the language area of the brain can result in difficulty speaking. When a head injury causes diffuse damage to the brain, it’s more difficult to predict what types of symptoms will develop. Diffuse injuries are diffused throughout the brain tissue, with microscopic damage to nerve cells (neurons) in the brain interfering with the normal flow of signals. There are specialists who understand these types of injuries and conduct in-depth follow-up tests so the right treatments can be prescribed. Signs and symptoms of head trauma affect everything from control over body functions to emotions, physical movement, and sensing the environment. Head trauma and brain injury cause very complex symptoms that require special medical intervention, rehabilitation and follow up. The good news is that the brain has an amazing ability to heal, recover, and find new ways of learning. This is called brain plasticity. Getting medical help as soon as possible after a head trauma improves long-term outcomes. Remember, any time you suspect head, neck or spine trauma you need to call 911. It's always best to err on the side of caution.